In Need Of Appliance Repair? Kenosha Appliance Repair proudly serving Kenosha and surrounding counties. Contact us today about our fast, friendly and trusted appliance service you need whether it's a repair, installation or maintenance we can do it. We're #1 In Kenosha For Appliance Repair. Call Us Today At (262) 612-3233 Or Click The Image Below. 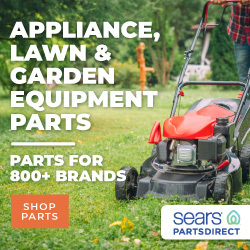 Kenosha Appliance Repair is an affiliate of Sears Home Services. When it comes to appliance repair, our service is second to none. Kenosha Appliance Repair has worked hard to earn the respect of the community in Kenosha, WI. We’re respected throughout the community because of our dedication and commitment to making sure that you get nothing but strong service, 7 days a week and fixing your appliance right the first time. We'll ask you a few key questions about the appliance. Book your appointment by phone or online. We will diagnose and explain the issue, and with your consent repair the appliance. After we complete the repair, maintenance or installation. You are covered by our 90 day satisfaction guarantee. Never worry about the tech repairing your appliance without your full consent. We verify with you before proceeding. Visit us online for best parts prices. We DON'T SELL PARTS but check out the following link? Our exclusive saves you 10% off any purchase with code PD2223 through 12/31/2017! If one or more of your appliances goes down, we've got you covered. Call us today and we can get your appliance back up and running ASAP. Is your refrigerator not cooling, oven not heating or your dishwasher leaking? Call us today. Has your dryer stopped heating up or is your washer not draining water or leaking? Contact us now. Do you need to have an appliance installed or maintained. We are the leaders in installs and maintenance. For the DIY'ers some times all you need is the part. Check out our online parts section. We cover a wide range of areas including the following: Benet Lake, Bristol, Caledonia, Camp Lake, Franklin, Franksville, Kansasville, Kenosha, Oak Creek, Pleasant Prairie, Racine, Salem, Silver Lake, Somers, South Milwaukee, Sturtevant, Trevor, Union Grove, Wilmot and Woodworth in Wisconsin. Or select a zip code: 53102, 53104, 53108, 53109, 53126, 53132, 53139, 53140, 53141, 53142, 53143, 53144, 53154, 53158, 53168, 53170, 53171, 53172, 53177, 53179, 53182, 53192, 53194, 53199, 53401, 53402, 53403, 53404, 53405, 53406, 53407 and 53408. Kenosha Appliance Repair offers repair services for cook tops, stoves, ovens, dryers, dishwashers, freezers, refrigerators, microwaves, washing machines and clothes dryers among others. We also service the following brands: ADMIRAL, AMANA, BOSCH, FRIGIDAIRE, GAGGENAU, GE, HOTPOINT, JENN-AIR, KENMORE, LG, MAGIC CHEF, MAYTAG, MONOGRAM, ROPER, SAMSUNG, SEARS, TAPPAN, THERMADOR, WHIRLPOOL, WOLF AND MORE. The technician was very prompt​. professional... Took care of our issue in less than an hour. The service person was very professional and polite. He diagnosed the problem and repaired the washer quickly. You've got questions, we've got answers. Take a look below at some of our most frequently asked questions and the answers to them. Kenosha Appliance Repair offers appliance repair service, maintenance and installation services Monday through Sunday from 8:00am until 10:00pm. You can call us and cancel your appointment any time prior to the appointment at any time online or over the phone. We only charge you for service call if you choose not to repair after receiving written estimate with appliance diagnosis from our technician. We quote flat rate price based on the cost of required replacement parts and average labor cost derived from the industry standard "Appliance Blue Book" known as MASNPG. We know you sometimes you wish you could just break your appliance. So we made an online game that will help you release some of that tension.